When you are planning a large event there are many things to consider. The venue, the guest list, the entertainment and the program to name a few. 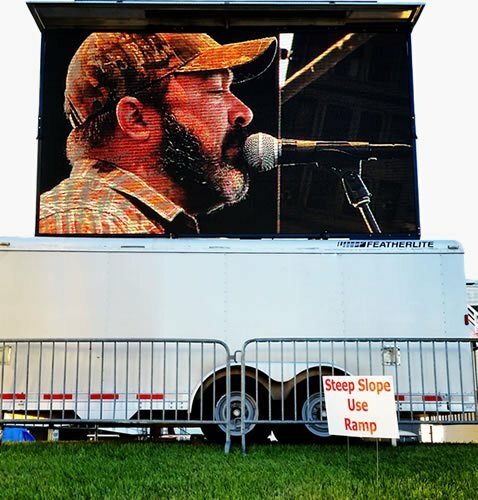 Depending on the size of your crowd and the venue you choose it may be important to consider whether or not you need a large LED screen jumbotron rental for your next event. Visual Impact Productions has many options for large screens, sometimes referred to as Jumbotrons. Many companies only offer one or two screen varieties, however we pride ourselves in making many sizes available to our customers including mobile screens! Don’t forget to ask us about the other services we provide, you can save money by using us for all your audio visual needs! We believe that if you, the customer, are not completely satisfied we have not done our job well. Our customer service providers will work tirelessly to make sure all your needs are desires are not only met but exceeded. We gain a lot of business through word of mouth, so it is our goal to not only make sure you come back to us for future events, but that you are so satisfied that you tell all your friends! We care about you, and want you to be happy with the services we provide. We know that the technical aspects of renting large audio visual equipment can be confusing so we want to make sure you feel completely confident and supported when renting from Visual Impact Productions. We use our years of experience to help you provide the very best for all of your events, without having to worry about all the fine details. When most people think large LED displays the name that comes to mind is “Jumbotron!” We are the leader in Jumbotron rentals. If you want your next event to make a HUGE impact, you have to have inquire about a Jumbotron Rental. The goal of a large screen at your next event is to make sure that every audience member gets a front row seat. We will work with you to find the right screen for your venue, so everyone has a close up view of the action. Don’t worry about the details, just give us a call and we’ll handle the rest, whether you are hosting a small event or a massive one, we have everything you need to make your event go off without a hitch! No more will your guests be running to the front trying to get the best view in the house. Visual Impact Productions will ensure that everyone has a great seat, whether they are in the front row or the very back. With Jumbotron rental screens, every seat is a great seat. Visual Impact Productions works all over the country. No matter what state or city you are in we want to work with you. Visit our website or give us a call today to talk with one of our amazing customer service representatives and get a free quote. We would love to work with you on your next event, what are you waiting for? Call Visual Impact Productions now!